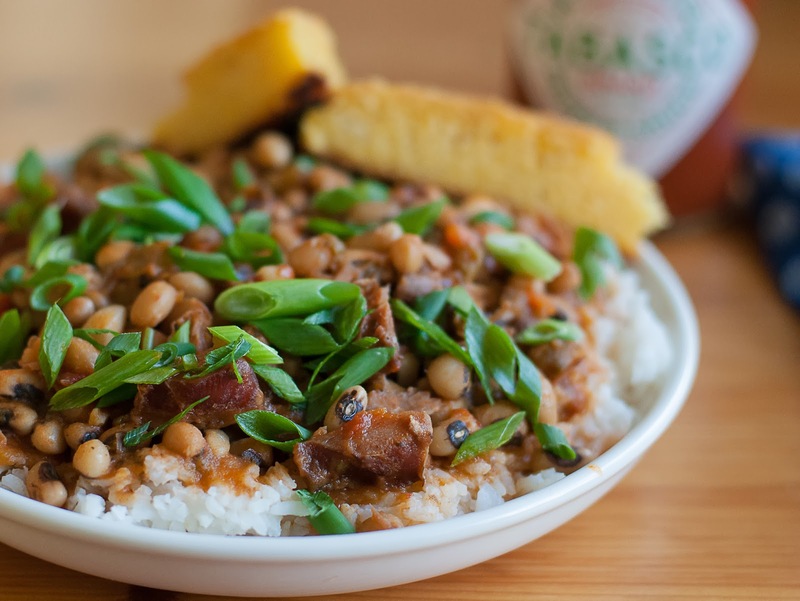 Grubarazzi: Hoppin' John, and a Happy New Year! Hoppin' John, and a Happy New Year! New Year’s resolutions are for the birds. At least that is what the media wants us to believe as they spout out how most of us make hefty resolutions only to fail time and time again. Personally, I love making over-the-top resolutions. I make quite a long list of things I want to change about myself and do for others. I find a category everything falls under, and then I narrow it down to one word. I use that word to give meaning to my entire year. When I’m feeling frustrated, or tired, or simply not amused, I remember my word and everything I have done to make it happen. We can all stay in touch with one word, right? Speaking of family and traditions, New Year’s Day has rules, ya’ll! Real simple rules to follow in order to gather up luck for the year ahead. One of those rules is to make a big ole pot of porky black eyed peas, rice, corn bread and greens to bring on the prosperity. The recipe below is tried and true. I learned it at my parent’s side since they cooked it every year since I can remember. Happy New Years, to my friends and family! May your year be filled with delicious food and lots of love. In a large Dutch oven, heat oil until it ripples. Add the ham hock (or smoked turkey leg) and sear on all sides. Add the onion, celery, green pepper, carrots, and garlic, salt and pepper to taste; cook until translucent; about 5-7 minutes. Add the frozen black-eyed peas, stock, bay leaves, thyme, Cajun seasoning, and diced tomatoes. Bring to a boil then reduce heat to simmer and cook for 40-60 minutes, stirring occasionally, until the peas are creamy and tender. Remove ham hock (or smoked turkey leg), pull off meat. Discard bone and place meat back in the pot. Serve Hoppin' John over rice sprinkled with green onions and a dash of hot sauce. Serve with a side of corn bread and greens for a traditional New Year's feast. Deeeeeeelicious - and a good healthy start to 2014. Love the addition of the smoked turkey leg as an alternative. Wishing you a very Happy New Year, Kimmi.